.221 BA, 4 homers and 10 RBIs. What the hell was Big Frank doing at first?! 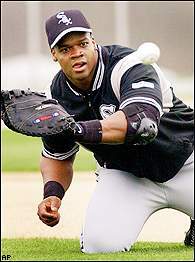 He has averaged 47 games at 1B the past 4 years and the ChiSox normally have the very capable Paul Konerko at first. Konerko only had 11 errors in 129 games in '00. Last week has dealt him the revelation of the triceps tear and the death of his father. I'll bet Big Mouth David Wells (CWS) feels like crap after saying that Thomas was a wussy on Chicago talk radio. I, too, give Big Frank grief as a Tin Man but he's a .319 lifetime hitter and has batted over .340 three times, which is why I expect more from him. The loss of Frank Thomas is not the only big name that is out this year. Superstars OF Tony Gwynn (SD), OF Ken Griffey Jr. (CIN), and 1B Mark McGwire (STL) are out nursing injuries and even second-tier stars are out like P John Smoltz (ATL), 1B Mo Vaughn (ANA). Other stars have been plucked from the limelight for other reasons. Bad boy OF Albert Belle (BAL) retired due to a degenerative hip injury. OF Bernie Williams (NYY) missed 10 games due to his ailing father, who passed over this weekend, which will cause Bernie Baseball to miss more games. However, baseball couldn't be doing better. Attendance is up and TV ratings continue to climb. Unlike football, basketball--which still isn't over the loss of Michael Jordan--or hockey--that HAD to bring back Super Mario--baseball is not a star driven. True, some folks consider that a fault of baseball and blame the league for not "creating" or marketing stars but baseball is about the game. The game is bigger than the players on the field. Baseball has its Wally Pipp--the Yankees first baseman before Lou Gehrig replaced him in the lineup and the rest is baseball legend. In essence, it is this constant rebirth and new blood that keeps baseball great. No position is more important than another position and no player is irreplaceable. The point is that stars will come and go but the game remains the same. I'm not saying that Baseball is without issues. The league needs to resolve revenue sharing. The players need to bury the proverbial hatchet with the owners before the end of this season or we will see a repeat of the 1994 strike debacle. If they don't, the long-term success of the league will certainly be in jeopardy. And, for Pete's sake, ditch the designated hitter rule (see above). It's like the PGA no cart rule--c'mon, you're supposed to be professional athletes. If you can't play the field, you don't get to hit. And how can you disadvantage American League teams during post-season play? Stand up to the player's association, level the playing field and eliminate the DH.